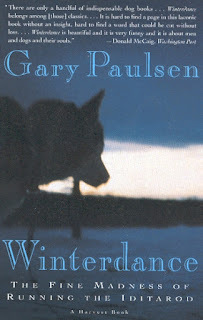 Summary (from the back of the book): Fueled by a passion for running dogs, Gary Paulsen entered the Iditarod--the eleven hundred and eighty mile sled-dog race through the Alaskan wilderness--in dangerous ignorance and with a fierce determination. For seventeen days, he and his team of dogs endured blinding wind, snowstorms, frostbite, dog-fights, moose attacks, sleeplessness, hallucinations--and the relentless push to go on. 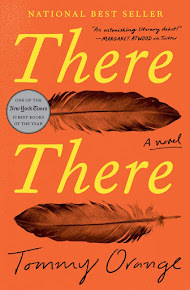 Review: I do like me a sport-related non-fiction book where people overcome major obstacles and this one did just that. I know Gary Paulsen from his YA fiction, but this man has lived quite the life outside of being a successful author! The Iditarod. All I knew was that it happens every year, in freezing temperatures, with beautiful dogs, and that the racers (called Mushers) must be crazy. I had no idea how long the race is, how long it takes, where it goes, or what it is like to run it. And now I know and I have so much respect for both the dogs and the mushers. Gary Paulsen tells a really good story and this one begins with him living in Minnesota and learning to love dogs and having a few to having 18 in the race. The reason I found this story so interesting is the bond that forms between the racers and their dogs. The work that goes into preparing for the race and all the details that happen during it. Did you know they stop every half hour to massage the dogs and check all their feet? Did you know that you fly in food and have it waiting for the dogs at each day's checkpoints? That there are vets who check every dog at every checkpoint? And the weather... woah! If you like dogs, Alaska, a good tale, and lots of suspense, then I recommend this quick read.